My Books Due Spring 2011! 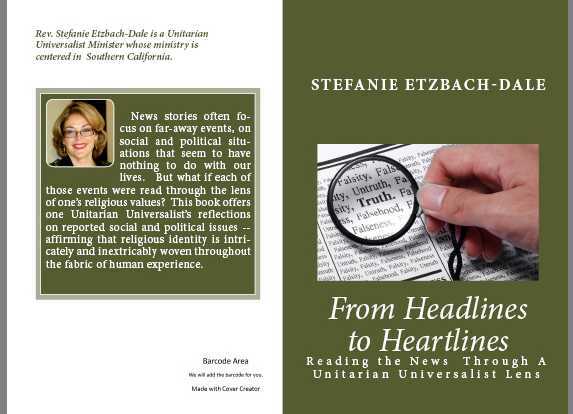 My first book, From Headlines to Heartlines, contains a series of reflections on current events, from a Unitarian Universalist perspective – everything from clergy sexual abuse to immigration reform, the presidential inauguration to “don’t ask don’t tell”… The intent is to draw attention to the inseparable link between personal religious values and the way we experience and respond to the world. 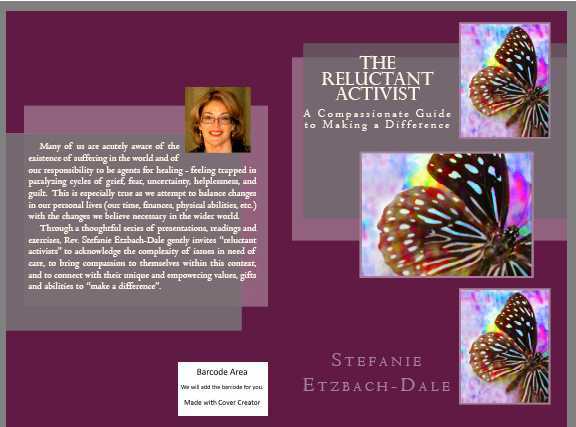 The second book, The Reluctant Activist: A Compassionate Guide to Making a Difference, is drawn from the series of workshops I presented at PSWIRL this past summer. It is geared toward those who may feel overwhelmed by the responsibility to make a difference in the world, especially while attempting to balance changes in their personal lives (time, finances, physical abilities, etc.) – offering insight into and encouragement towards authentic, meaningful, sustainable activism. The net proceeds of this book will be donated in equal parts to Camp deBenneville Pines and the Unitarian Universalist Service Committee. Both books have been compiled with the extraordinary efforts of Inge Etzbach, my mother, and the support of my muse, George Dale, and should be available Spring 2011. This entry was posted in books, current events, hope, spirituality, unitarian universalism, worship resource. Bookmark the permalink.